As I mentioned yesterday, we're BIG fans of Halloween... what I didn't mention is we're also pretty big fans of books! Whenever I was pregnant with D, we would seriously go book hunting at second hand stores, trying to find all the best books to stock up her library... and we also asked for books in place of cards at our baby shower, which rewarded us with quiet the collection! What's awesome about our hoarding of books other than a plentiful library? Delainey already has a list of favored books and she will grab them and hand them to us, insisting we read them over and over again. I may be making assumptions here, but I think she already has a love for reading... and I'm hopeful it's because we encouraged story time from day one (and even read to her in the womb). 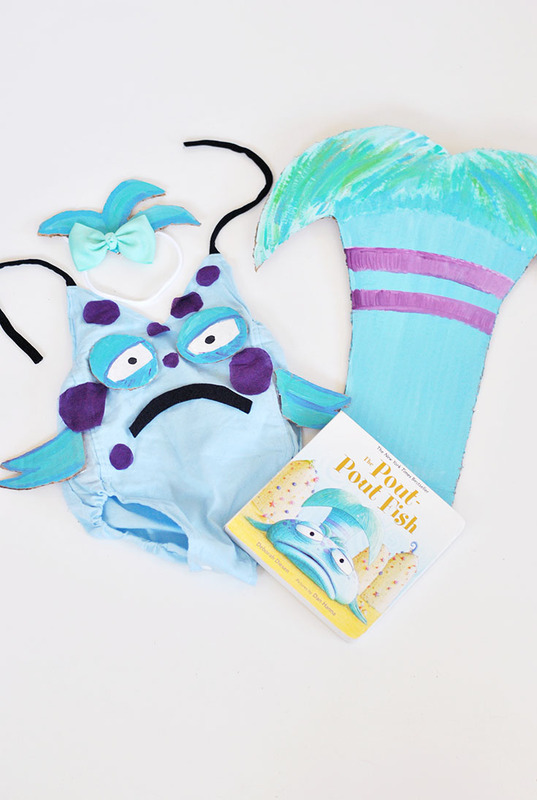 One of her favorite books for us to read to her is The Pout Pout Fish. 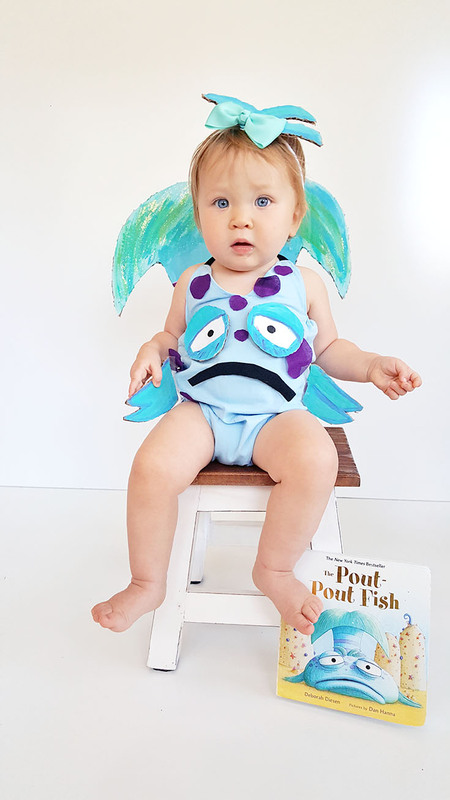 So when I was brainstorming a list of Halloween costumes we could easily make DIY projects, of course her favorite little fishy friend was one I knew we would have to make come to life. With that said, this costume is a little more involved than some of the others I'm going to share but definitely not difficult... I will say, the time I spent making this costume was under a couple of hours and the results are epic. So, here it is... 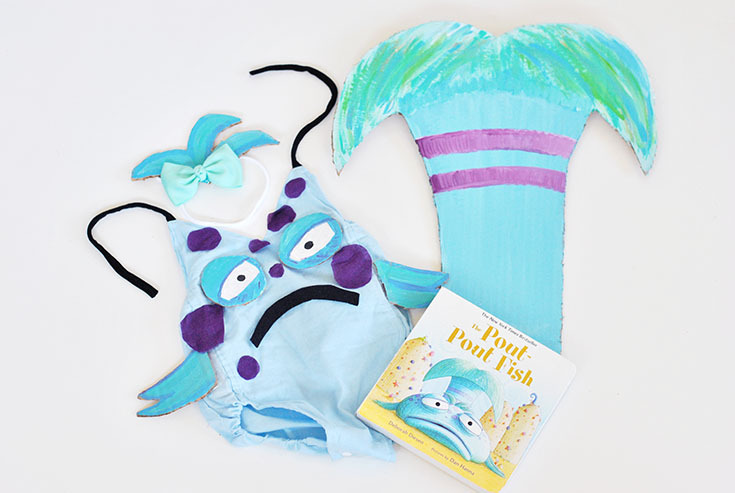 I hope this DIY Pout Pout Fish costume spreads the cheery-cheeries around instead of the dreary-wearies, cause it's so cute I couldn't help but smooch, smooch, smoooooochhhhh this sweet little fishy! 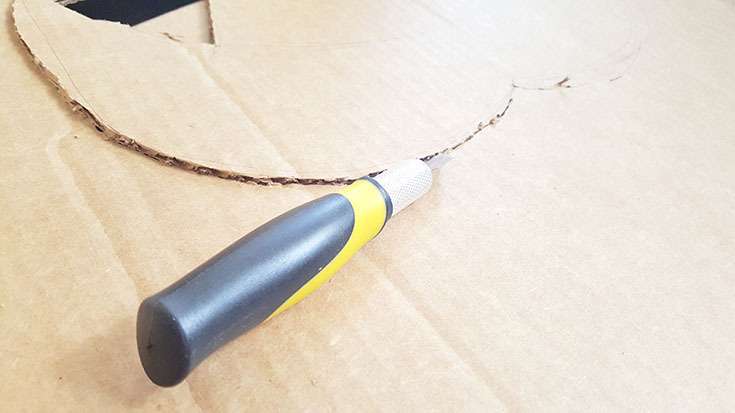 To get this project started, you'll want to begin by cutting out the tail. I literally just used a pen to make a rough draft shape of his tail and ta-da. It worked out perfectly. Be careful cutting and be sure to try and keep your edges clean and the sides of his tail even. Next you'll want to break out the paints. Go ahead and paint his tail, I used an overall coat of light blue, then some blue-green, then green, then a few lines of white, etc. Adding a little glitter at one point and then continuing to paint on top of that added the perfect shimmery effect I was looking to create. 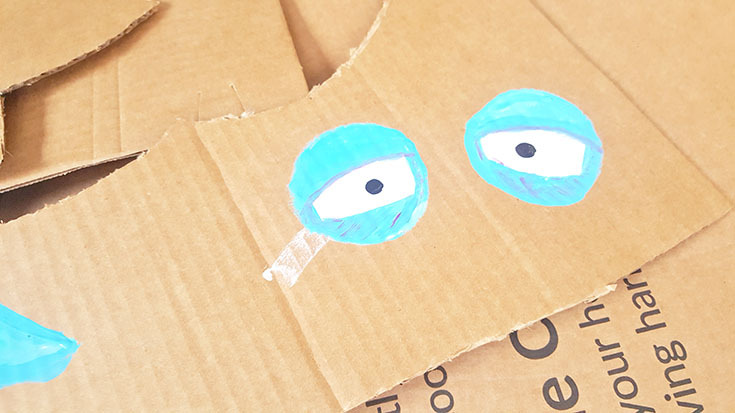 After that, I used scrap pieces of cardboard from making the tail and painted eyes, two circles, with little half circles and tiny circles inside - super simple. Followed by little fins! 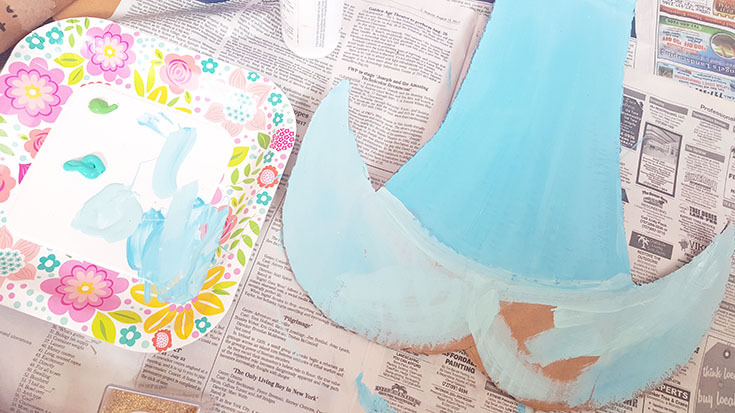 While all of this was drying, I took the time to cut out some circular spots from the purple fabric I just happened to have laying around - from an old dress of mine! 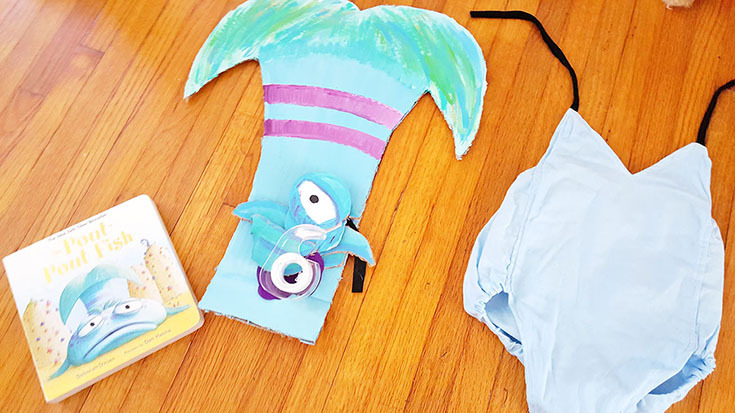 I also cut out THE most important part of the costume - The Pout Pout fish's mouth! 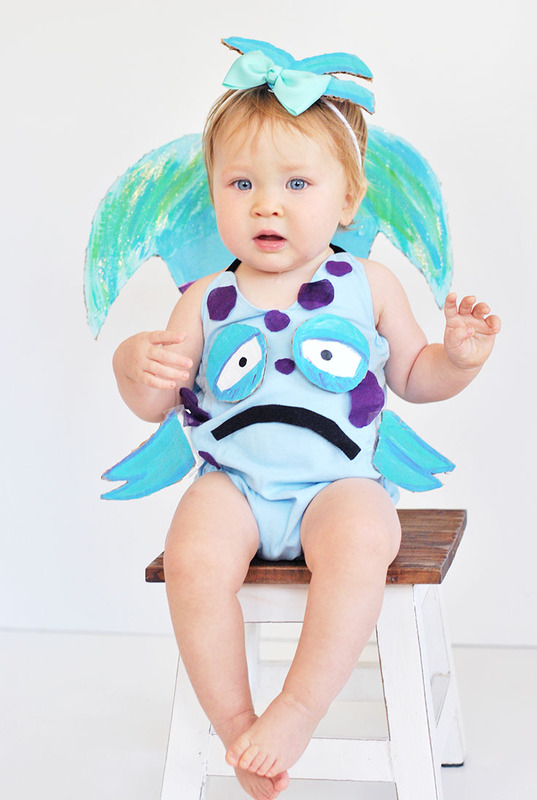 Next I attached everything to our baby blue romper... and this is where I went wrong. 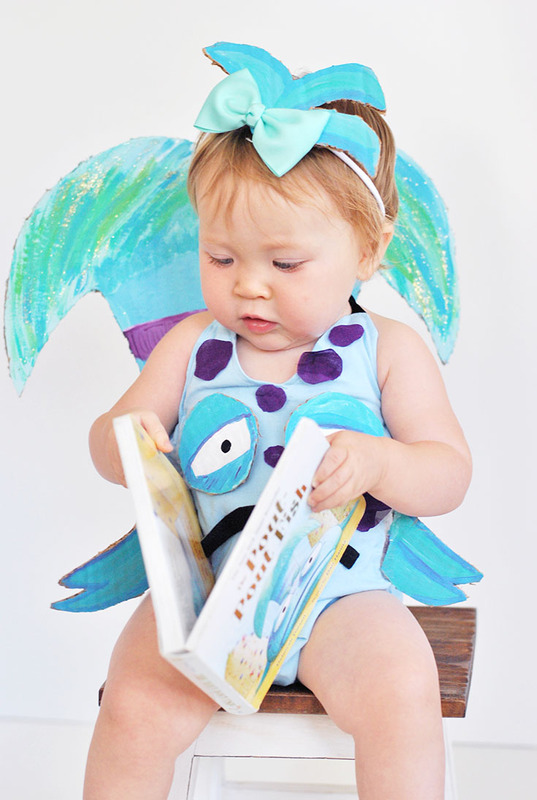 I used tape because our Baby Bird Boutique items are coveted pieces of treasure to us - but I know this costume would have held up and been a lot tougher had I used hot glue or even velcro pieces. With that said, tape totally worked, it just also was tempting and way too easy for Delainey to peel off her Pout Pout eyes or spots! Last but not least, I added a DDBB itty bitty bow to her head piece and secured it to a nylon headband for comfort! 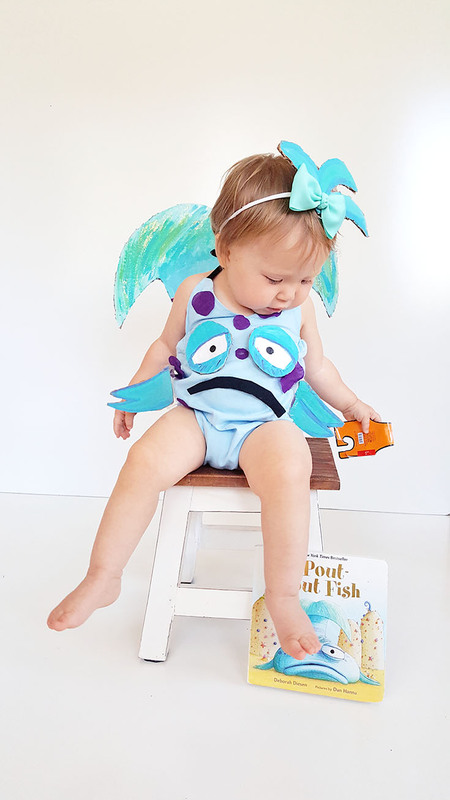 Now my little Pout Pout Fish is ready to take on the sea and maybe get a few more smooches from her Daddy and me. So tell me, do you and your kiddos have a favorite book to read together? Is there a book character you would love to see us create a costume of? I'd love to hear your input in the comments below!